Nicole Bond is a writer and performance poet, is a member of the Chicago Slamworks House Ensemble, and a winner of their LitMash multi genre literary slam competition. Her work has been featured on WBEZ, in the Neighborhood Writing Alliance Journal of Ordinary Thought, and the Museum of Contemporary Art, among others. She is a gentrified refugee from Hyde Park now in South Shore. Elaine Hegwood Bowen, MSJ has covered both Chicago’s urban and suburban communities, writing for the Chicago Crusader since 1994 and previously writing for The Doings Newspapers. She grew up in Englewood, has been living in Bronzeville since 2004, and has taught at City Colleges of Chicago and Roosevelt University. Elbert Tavon Briggs currently collaborates with the Randolph Street Brown Bag Poets and Poets & Patrons. His work has been published in the Northeastern Illinois SEEDS Literary & Visual Arts Journal and The New Verse News. Dane A. Campbell is a high school English and drama teacher in Chicago whose works have appeared in The Garland Court Review, The Black Magnolias Literary Journal, and the Chicago Center for Literature and Photography All-Star Anthology. He has just completed a novel, And When Nobody Cared, from which “What Becomes of the Trained” was excerpted. Mari Cohen wrote her first poem, about jack-o’-lanterns, at the age of five and has been trying to live up to that debut ever since. She has won awards for her poetry from Michigan State University and Albion College, and has been published in The Albion Review, The Mochila Review, Sliced Bread, and others. She also writes and edits for the South Side Weekly. Aerin Cooper wasn’t born. She arose from sea foam of the Gulf Coast and never looked back. She lives for language, sound, and, most importantly, how both influence life and the conscious world. She is a senior at Columbia College, majoring in poetry. Paul Dailing is a freelance journalist and creator of 1,001 Chicago Afternoons,which was a winner of a Peter Lisagor Award for Exemplary Journalism. Read more at 1001chicago.com. Amelia Dmowska is a staff writer for the South Side Weekly. She also runs ArtShould, a student organization that provides free after-school art classes at local schools, and co-directs StoryArts Summer Camp, a free summer program that encourages students to share stories through different artistic mediums. Stephen English is a short story author and humorist. He is a graduate of Kent State University and has done graduate work at Northeastern and Columbia College, Chicago. He and his husband, Ryan, live in Beverly and own The Blossom Boys, a floral design studio and Fair Trade crafts gallery. O.A. Fraser lives in Hyde Park. He is a member of Chicago’s oldest writing group and often hosts multi-genre salons in his home or garden. Corey Hall is the editor and publisher of Expressions from Englewood, a journal that features the best personal essays, poetry, fiction, and “papers of research” from people living, working, and/or going to school in the Englewood community. Claude Robert Hill, IV has been writing poetry since he was nine years old. Most recently, he published a poetry and short stories digital book, entitled I am the Namaste Child on Amazon. He is a resident of Auburn Gresham. Mack Julion is a Chicago native, a teacher, and a justice advocate. He is a spoken word activist who uses his voice to bring attention to injustices in our community, city and country. He also works with the youth ministry at the Faith Community of Saint Sabina. Sophie Kennedy is a writer and performer. Originally from Memphis, she lives with her yellow lab, Linus, in Hyde Park, where she is a fourth-year student at the University of Chicago. Tony Lindsay’s latest work is a collection of short stories titles, Almost Grown. He has an MFA from Chicago State University. Dakota Loesch is a Chicagoan and an interdisciplinary artist. He is a co-founder of Artful Enough Pictures, the author of You Are an Idiot, and a songwriter for the traveling rock outfit Animal City. His latest release is a collection of twenty-seven poems entitled Beer Money. Andrew Lovdahl is a six-year South Sider. He likes the strange remains of other centuries, working at The Plant, and memorizing the grid plan of Chicago for no particular reason. Khaleelah D. Muhammad, J.D. is a South Side native, community organizer, wife, and mother of three. She enjoys reading to children and writing. She runs Stringweavers, a crochet and knitting program at Thurgood Marshall Library. David Nekimken lives in a housing co-op in Hyde Park of twenty adults and two children. He has had poems published in the Journal of Ordinary Thought and the Journal of Modern Poetry. Diane O’Neill is a lifelong Chicagoan. Her career has focused on two passions: creative writing and disability rights. She works as a curriculum designer and writer, and she holds an MFA in Creative Writing with distinction from National University and a BA in Writing/English with honors from Columbia College. Five of her essays have been published, including one as an op-ed in the Tribune and “My Son’s Race” in last year’s Lit Issue. Vincente “SubVersive” Perez is a poet, activist, and musician who focuses on the lived experience of race in America through several mediums. He is currently writing and producing a print and audio chapbook, B(lack)NESS & LATINI(dad), which examines Black and Latinx experiences through the lenses of hip-hop, spoken word, and narrative to challenge the idea that we live distinct political, social, and economic lives. Mike Pocius is a lifetime South Sider, street photographer, and occasional art organizer. Dmitry Samarov paints and writes in Chicago. He has exhibited his work in all manner of bars, coffee shops, libraries, and even the odd gallery (when he’s really hard up). He is the author of the illustrated work memoirs Hack: Stories from a Chicago Cab (University of Chicago Press, 2011) and Where To? A Hack Memoir (Curbside Splendor, 2014). He no longer drives a cab. Hannah Shea studies English at the University of Chicago. Her preferred place to write poems is in her cubicle at the UofC Press, and her preferred job is behind the counter at Grounds of Being Coffee Shop. Dan “Sully” Sullivan is a Chicago native and founder of the Urban Sandbox, a youth-focused poetry series in Logan Square. His first collection of poems, The Blue Line Home, is now available from EM-Press. 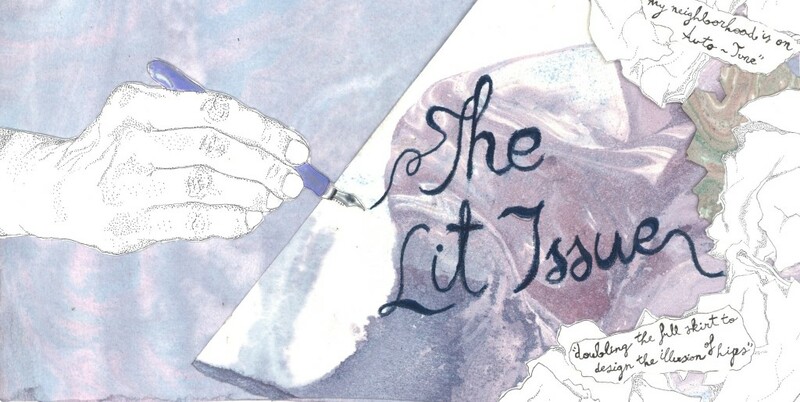 To read an account of our Second Annual Lit Issue Release Party, click here. To see last year’s Lit Issue, click here.